This article is part of our “CleanTechnica Answer Box” collection. In this collection of articles, we respond to dozens of common anti-cleantech myths. Myth: electric car well-to-wheel emissions are larger than gas car well-to-wheel emissions. Short answer: Electric car well-to-wheel emissions are far, far less than gasmobile well-to-wheel emissions. New technology always makes lots of people uncomfortable. It’s just a part of human nature to fear the unknown. That’s the way it was with radios, telephones, and air travel before we got used to those newfangled things. Unfortunately, there are always some people who spread false information about new technology, especially if it threatens to interrupt their source of income. That’s precisely what is happening with the electric car revolution right now. The people who have become wealthy selling cars and the fuels that make them go are petrified that electric cars are going to deprive them of the enormous profits they are used to, so they manufacture falsehoods designed to scare people away from considering purchasing one. A favorite fib is that electric cars pollute the environment just as much as conventional cars do. Let’s blow that myth out of the water right now by looking at the facts, not the lies the car companies and fossil fuel interests want you to believe. The Union of Concerned Scientists has done a thorough study about this that took two years to complete. 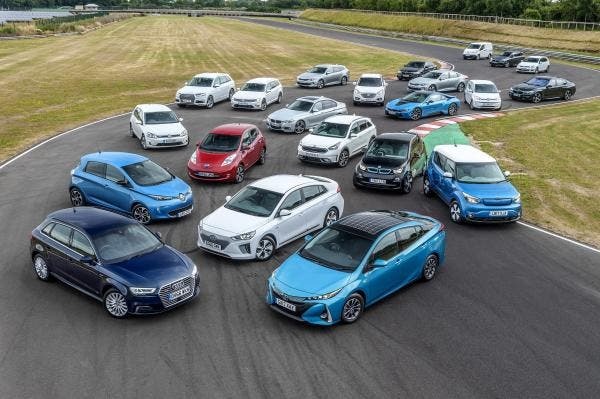 The scientists wanted to know exactly how many emissions conventional cars were responsible for and how many emissions electric cars were responsible for. It’s conclusion? “We found that battery electric cars generate half the emissions of the average comparable gasoline car, even when pollution from battery manufacturing is accounted for.” Half. “An all-electric vehicle (EV) does not produce emissions from the tailpipe, but there are upstream emissions (also called well-to-wheel emissions) of greenhouse gases from electricity production. Using electricity production data by source and state, the Alternative Fuels Data Center has estimated the annual carbon dioxide (CO2)-equivalent emissions of a typical EV. “EVs charging in Vermont are estimated to produce the fewest emissions – oil and gas make up only 1.2% of the electricity sources in the state while cleaner sources such as nuclear, hydro, biomass, wind, and solar make up the rest. West Virginia’s electricity production is 95.7% from coal, making it the state with the most well-to-wheel CO2-equivalent emissions. The Union of Concerned Scientist also has a helpful graphic that shows how many miles per gallon your conventional car would need to get in order to equal the emissions performance of an electric vehicle. That number ranges from a low of 35 mpg in some areas to 135 mpg in upstate New York. When either a conventional car or an electric car reaches the end of its useful life, both require about the same amount of energy to dispose of. But electric car batteries can be repurposed for other non-automotive uses like residential and commercial electrical storage, or the materials inside can be recycled for new batteries or other uses, which means the batteries will continue to reduce the amount of carbon dioxide going into the atmosphere long after the car they started out powering is no longer on the road. It’s been said that 95-99% of the material in EV batteries can be recycled. Tesla plans to take back batteries, take them apart, and use the materials to create new batteries all in the same factory. Well-to-wheel emissions studies pretty much never take this reuse or recycling into account. Another important point to remember is that many drivers can put solar panels on their roof to power their electric cars. In fact, CleanTechnica research has found 28–42% of electric car drivers have rooftop solar, and another newer report of ours pinned it down to 32%. Of course, it all depends on regional and individual factors (YMMV), but a large portion of today’s electric car drivers are indeed driving on sunlight, not coal. So, where do these myths come from? A lot of them can be traced directly to Charles and David Koch, the dynamic duo of disaster who like to use their considerable wealth to buy Congressmen and governors who will do their bidding. Those fun-loving Koch boys are the same people funding the war on climate science. But now that you have the necessary information, you don’t have to fall for their tricks anymore. The truth of the matter is that electric cars pollute far less than conventional cars over their lifetime. If you have read this far, maybe it’s time to experience an electric car for yourself. People who don’t like electric cars tend to be people who have never tried an electric car. Put your fears aside and take a test drive today. You might be surprised to find how nice driving an electric car makes you feel.